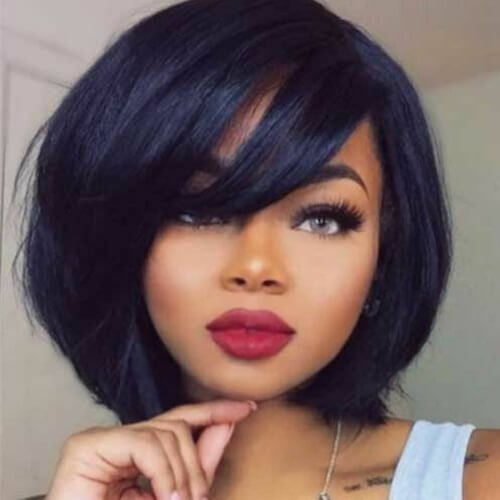 Regardless if you’re growing out your natural hair, have a short ‘do or fabulously long locks, you can have fun with countless black hairstyles. 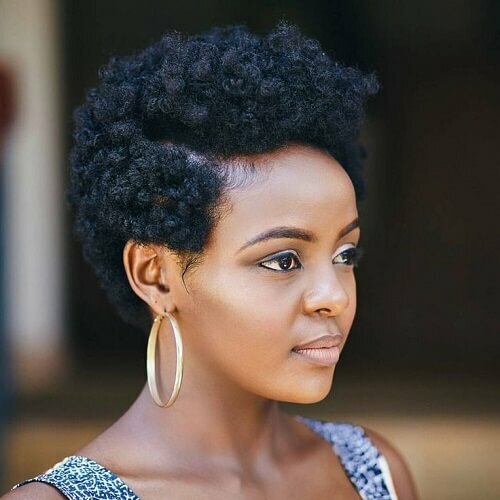 In addition to short and long haircuts of all kinds, black women can experiment with beautiful traditional African hairstyles. 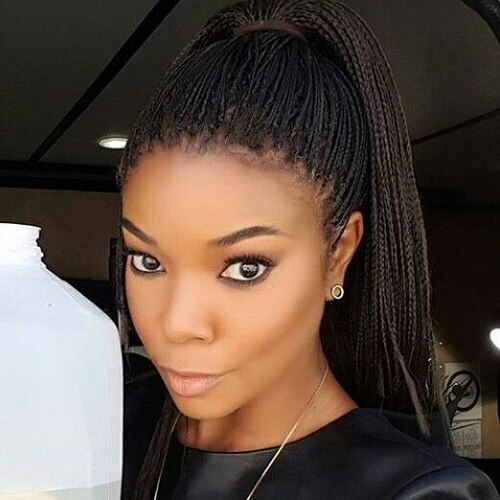 Even more so, they can style their natural locks in various ways to flatter their facial features. 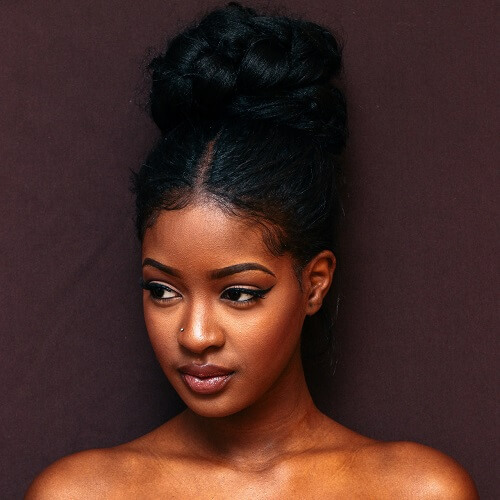 Get inspiration from these hairstyles from African American women below. 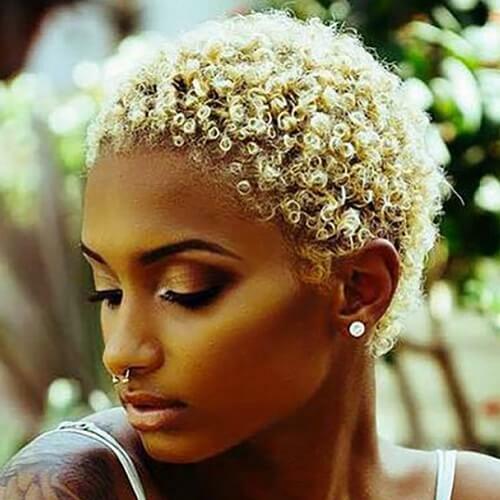 Pixie haircuts are all the rage for women of all skin tones. 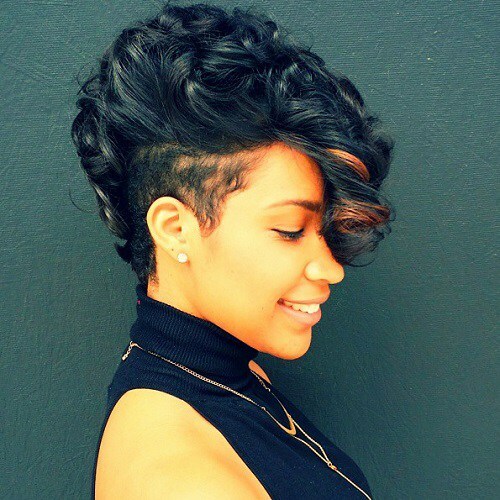 If you’re rocking natural hair, this pixie cut with soft curls is a great way to bring out your femininity. 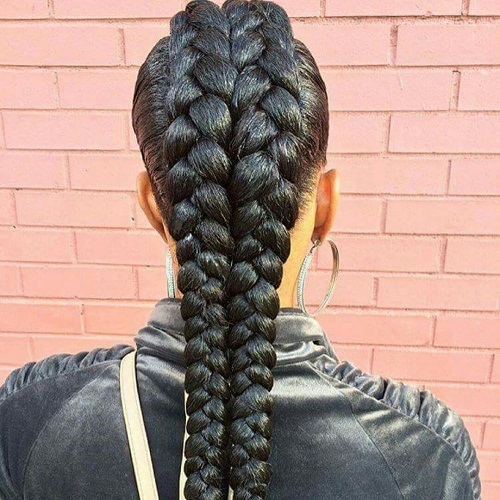 African American women enjoy a wide range of braided hairstyles. 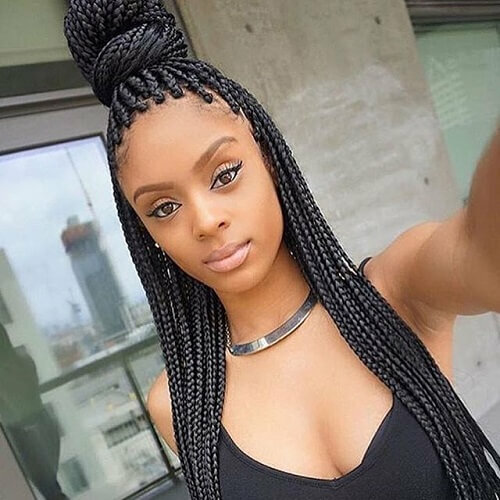 Box braids are one of the most popular options that complement any face shape beautifully. Get them long, short or mid-length and style them as you please. There’s truly something uniquely chic about bob haircuts. 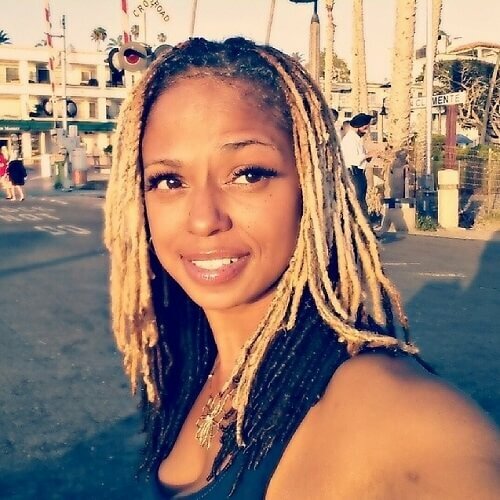 African American women rock them amazingly, no matter if they choose to keep their natural hair color or go for a honey blonde shade like above. Make your little girl feel like a princess with a pretty braided hairstyle like this one. The criss-cross braids are adorably decked off with two bows and double curly puffs. 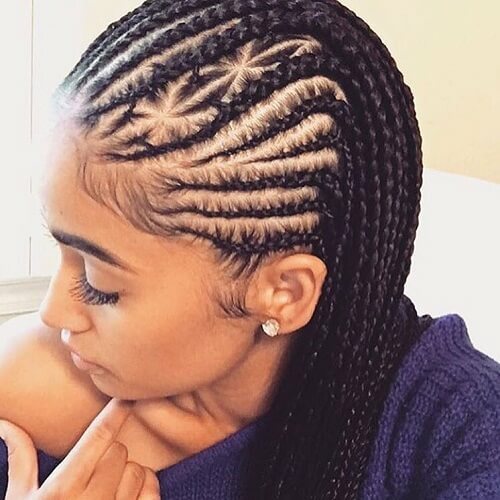 Goddess braids are yet another ever-popular hairstyle for black women. One of the top advantages is that you can style them with ease. This goddess braid chignon shows you how. 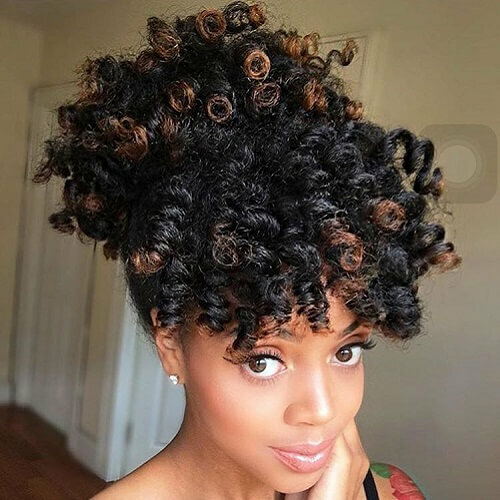 Go all-natural with these stunning flat twist out curls. Dyeing the tips in your color of choice outlines the curls even better, as well as the puffy ponytail with bangs. 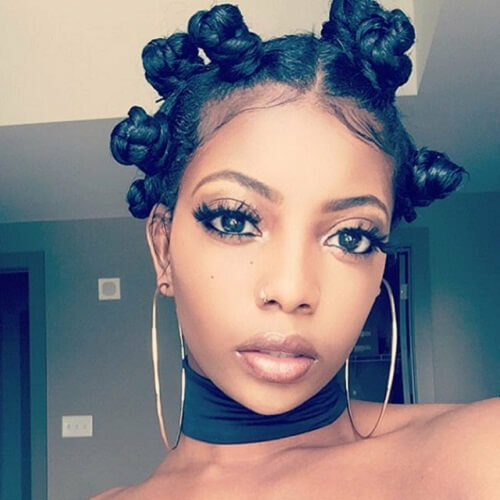 As far as traditional African hairstyles are concerned, bantu knots have been constantly trending since the 90s ‘til today. It’s completely understandable why – they mix chic and edgy perfectly. 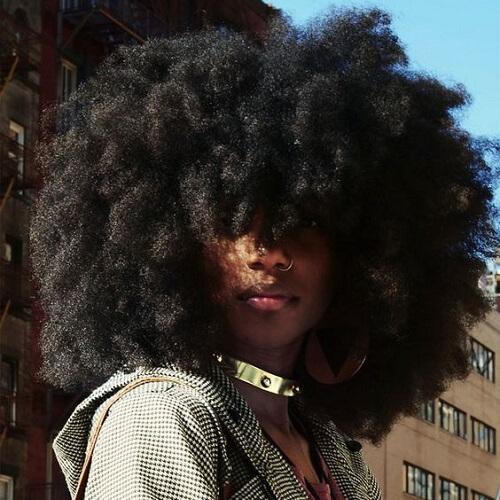 Another natural black hairstyle is letting it all loose with a huge afro. The volume and dynamism that a natural afro provides is immeasurable, as well as the gorgeous result. 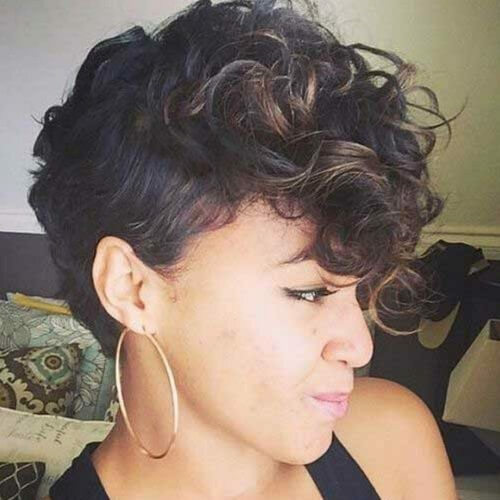 This is one of the ideal black hairstyles for growing out a pixie haircut. It’s actually just between a pixie and a bob, so all you have to do is let those curls bounce around stylishly. 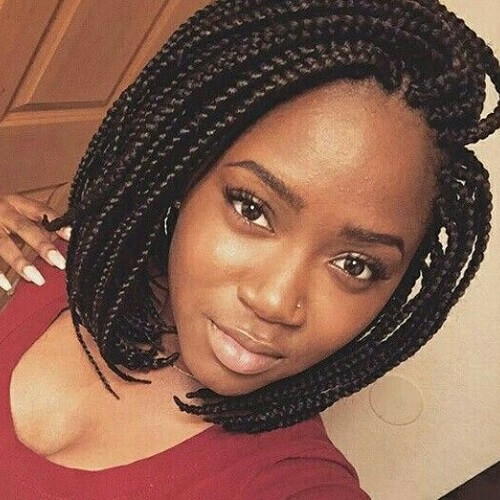 Box braids come in several shapes and sizes. 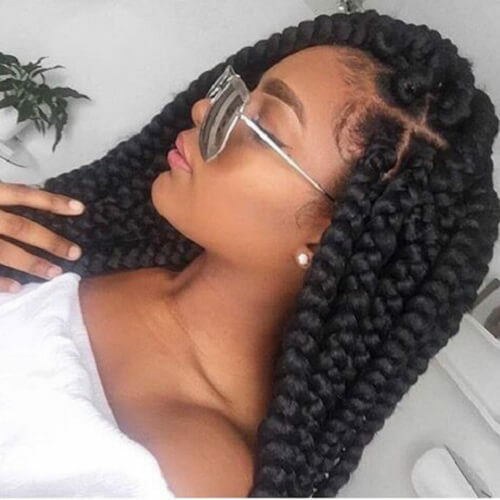 Jumbo braids are charming, and are a fantastic way to draw attention to your lovely locks. 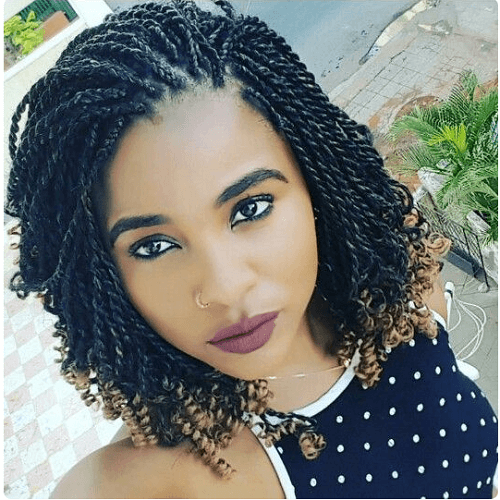 Twist braids are cute, feminine and beautiful all in one. To spice up a head full of typical twist braids, you can unwind the tips and dye them in a lighter shade. 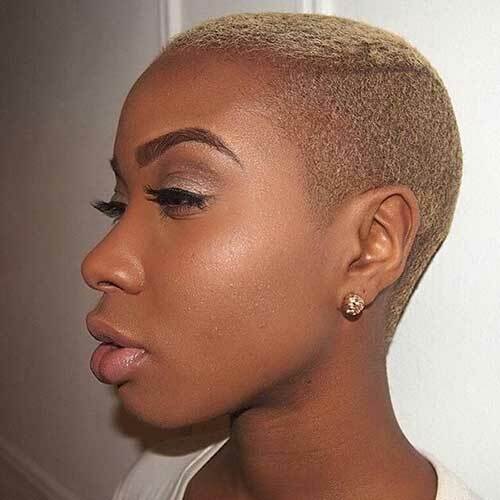 African American women know that a TWA (Teeny Weeny Afro) is one of the next steps after the BC (Big Chop). 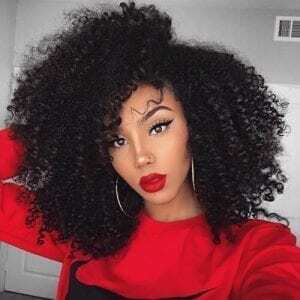 Even though it’s a stage in growing out natural hair, you can go through it glamorously with black hairstyles like the one above. 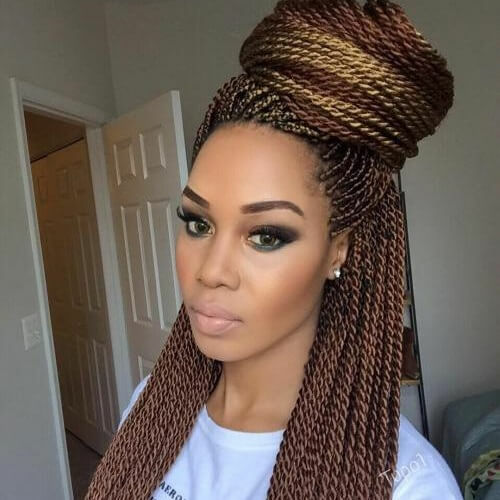 Yet another one of the African hairstyles that shine with beauty are Senegalese twist braids. No matter what color you choose to get them, they have a special glow and look amazing when styled creatively. 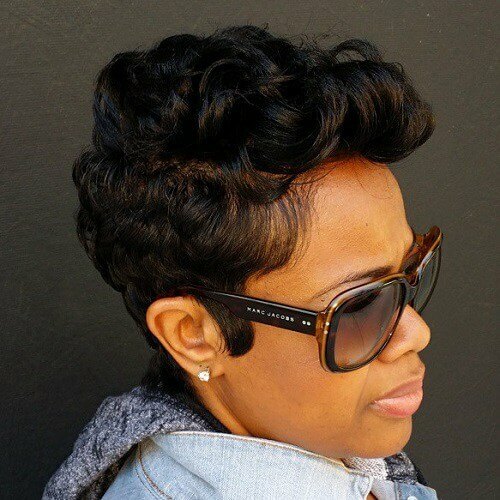 This is an additional example of how to rock a TWA. 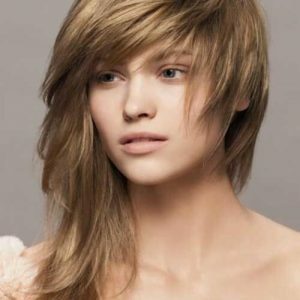 It’s different from our first example by maintaining natural hair color, just so you know that this is an option as well. 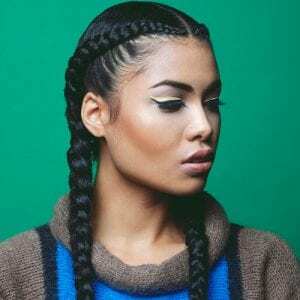 Ladies who want an urban edge to their black hairstyles can always opt for corn rows. You can either go for a classic approach or play around with designs, like in the photo above. Throughout the years, Rihanna has definitely shown us that we shouldn’t be afraid to sport bold hair colors. This combination between hot pink and red looks astounding on women with darker skin tones, so keep it in mind when picking your hair color. Big, soft curls have always looked extraordinary on long hair. If you prefer rocking long locks, this is certainly a styling option to keep in mind. Not only is it appropriate for all occasions, but it also looks breathtakingly beautiful. 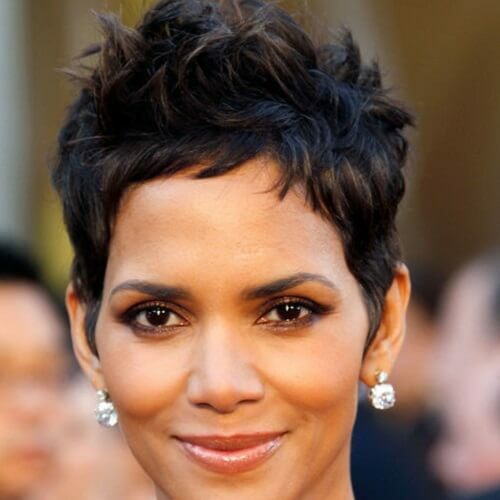 Another celebrity that has been an inspiration for black hairstyles for decades is Halle Berry. The renowned actress wears a razor pixie cut quite like no other, and shows us that we can do it flawlessly too. 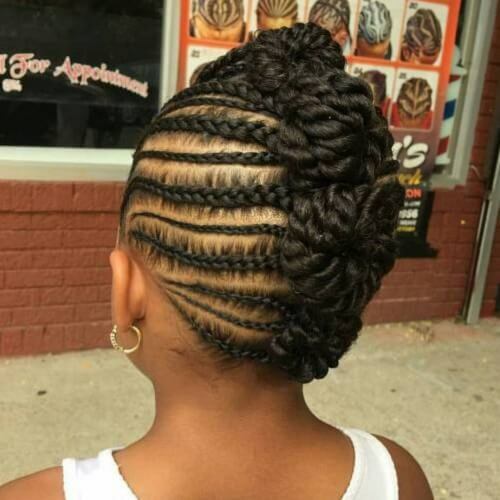 Creative braided hairstyles for little girls are numerous. 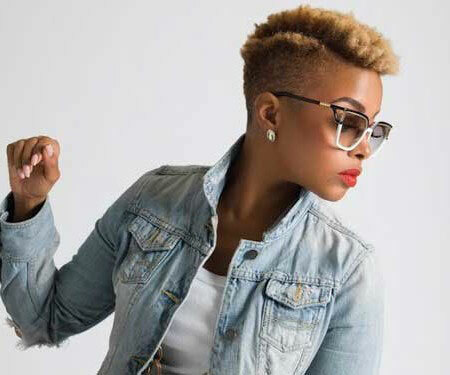 This faux hawk, for example, gorgeously combines horizontal corn rows with braided bantu knots from top to bottom. 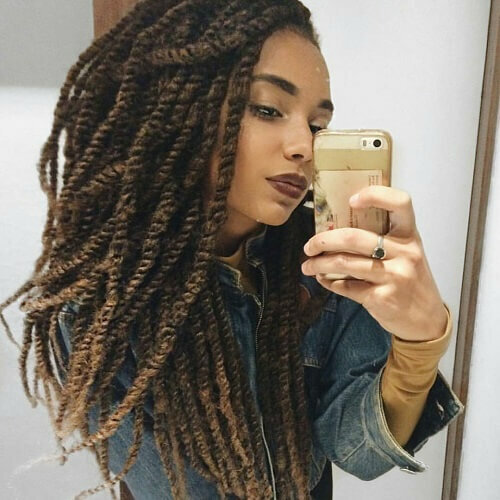 Dreadlocks have a unique appeal that can’t be replaced by any other hairstyle. 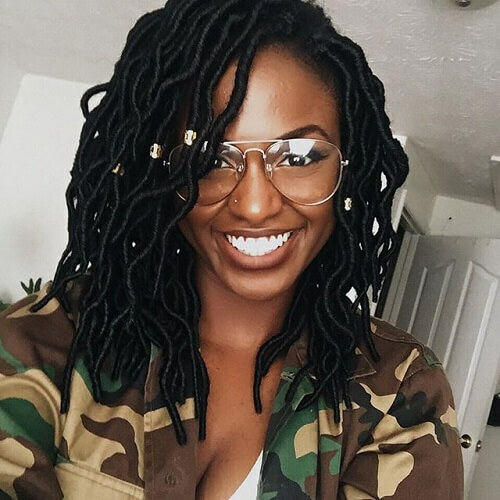 However, many women don’t want to damage their hair, so they opt for faux locs. The visual result is quite similar, while your hair is protected in the process. Bob Marley is known around the world for his massive contributions to reggae music. However, he also indirectly contributed black hairstyles with what we call the Marley twists. Inspired by Marley’s famous hair, these twists look wonderful in all lengths. Let those pretty corkscrew curls bounce around all day. 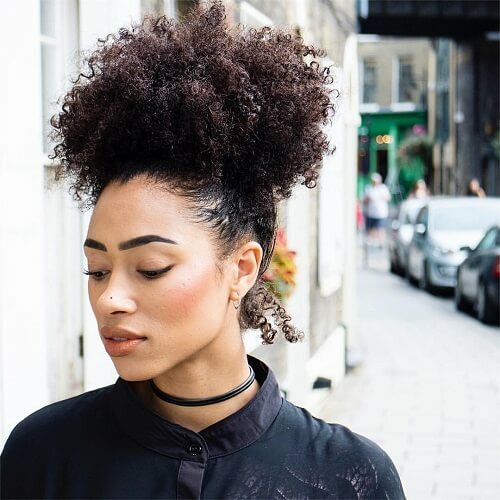 If your hair is about shoulder-length when left curly, you should definitely take this natural hairstyle into consideration. Whoever said that mohawks were only edge? If you combine them with long bangs and luscious curls, you can get the best of your rebellious and elegant sides. Add some color for extra glam. Among goddess braided hairstyles, the feed in technique is highly popular. They shape the braids glamorously and look exceptional on women of all ages. If you want to change the texture of your hair, go for yarn braids. Like their name suggests, they are literally braids out of yarn. You can use them in an extension fashion for getting longer, soft locks. Mohawks can also be recreated through braids. These two long, parallel braids have an awesome mohawk effect. It allows you to get your wild side on without shaving the sides to get a real mohawk. No matter if you’re prepping for a fancy event or you’re generally a posh gal, an updo like this will guarantee heads turning. 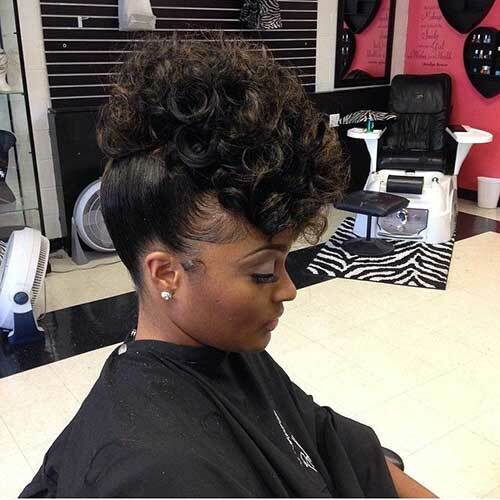 The spectacular curls on top make this updo memorable, to say the least. 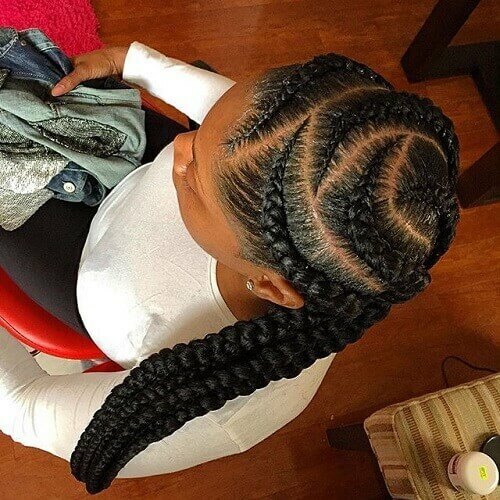 If you have the necessary patience to get them done, micro braids are an incredibly cute approach to black hair. Indeed, it will take a while to get them done, but the results are marvelous. 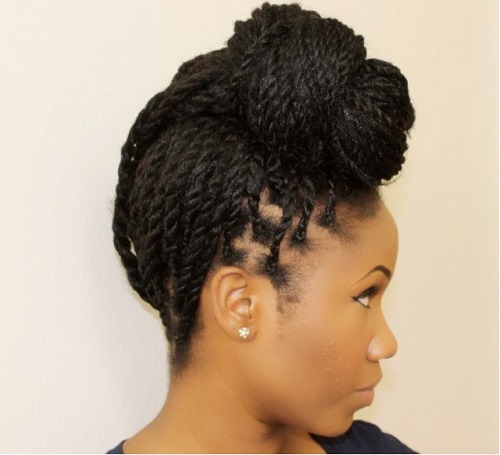 Going back to African hairstyles, this list wouldn’t be complete without Nubian twists. 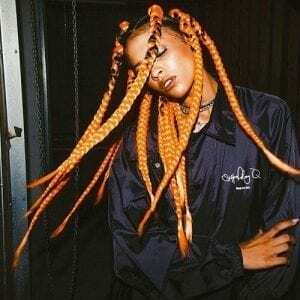 These coil-like braids are another funky fresh way to rock black hairstyles while looking fly. If you treasure your natural hair, show it off on one of the most important days of your life. Strapless wedding dresses allow you to let your hair down (literally) and showcase those extraordinary afro-textured curls all around. French braid pigtails are trending now more than ever. These classic and classy braids not only look magnificent in selfies, but also in any setting, from school, to the office or a romantic date. 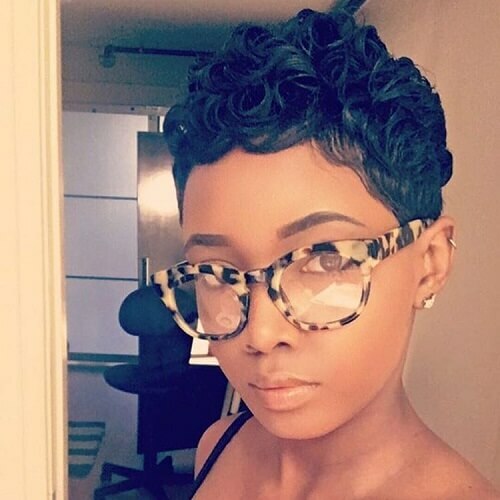 This is the perfect idea for women who just went through their BC (Big Chop) and are ready to grow out their natural locks. 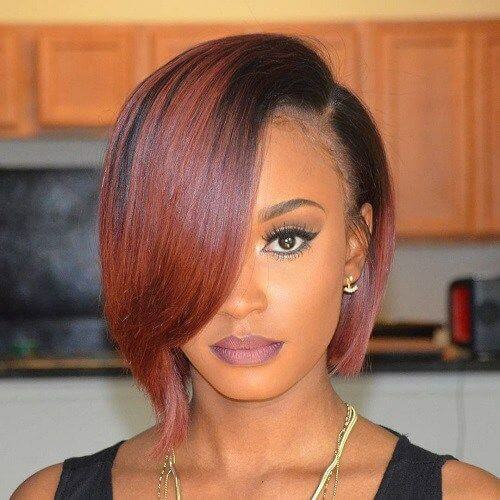 If you want to glam up your shaved hairstyle, bleach or dye it in your favorite hair color. To put it shortly, a lace braid is usually a braid that crosses the crown of your head by being ‘laced’ into the rest of your hair. 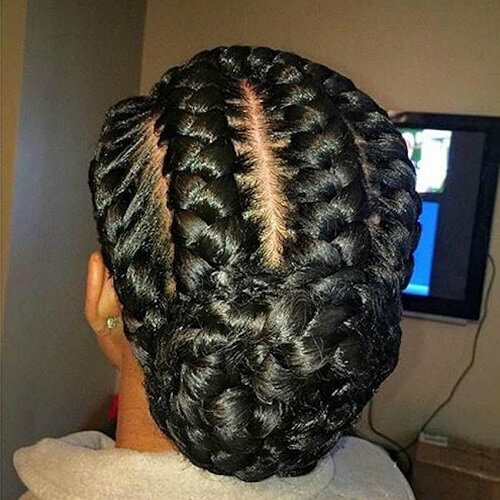 It’s one of the cute and fancy black hairstyles you can consider for special occasions. The sky is the limit when it comes to weave options, but the only shown in the picture above is one of the most popular. 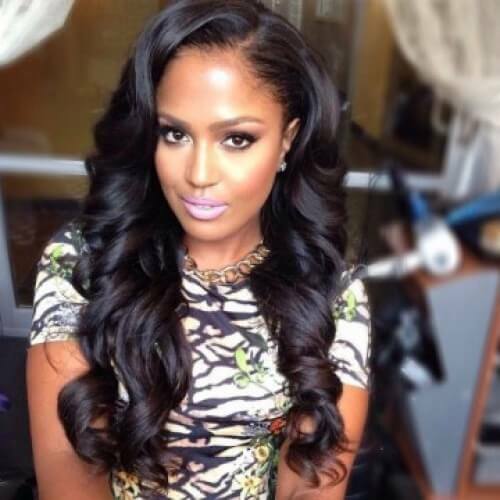 Long, wavy hair is a flattering option for almost any African American woman. Jada Pinkett Smith is an inspiration for women worldwide for numerous reasons. In addition to her multi-talents, she shines through glamorous hairstyles. In this photo, you can see how a brown balayage looks against a darker skin tone. Another way to wear a bob is asymmetrically. It helps contour your jawline, while serving as a refined hairstyle that can be worn everywhere. You can choose the lengths for each side according to your preferences. 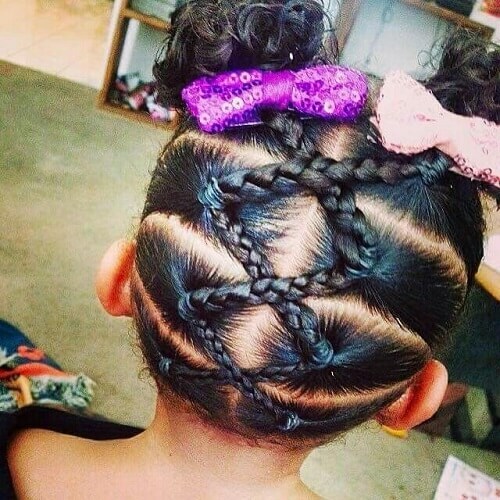 An adorable toddler deserves an equally adorable hairstyle. 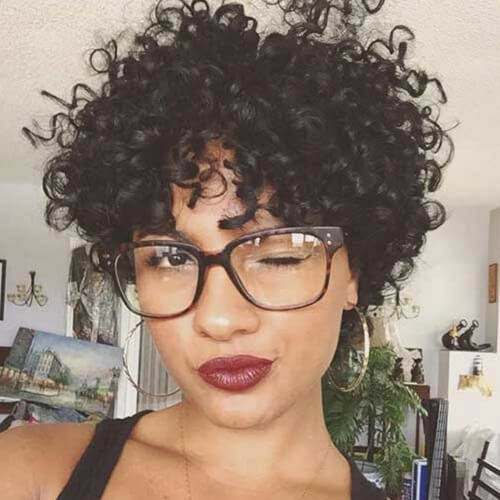 An extremely cute black hairstyle is this double ponytail, with the bangs brought up to the front and the rest sleeked up in the back. The results? 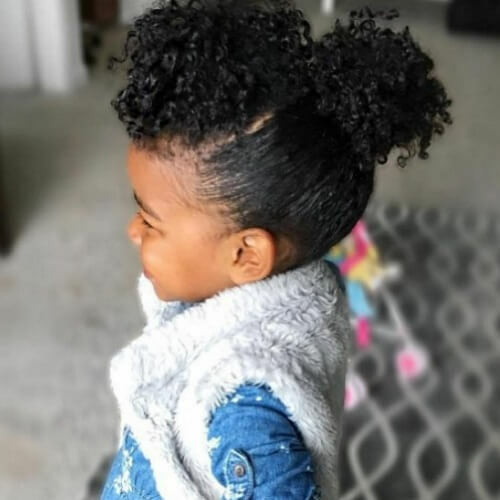 Two heartwarming curly puffs that your little one will adore. 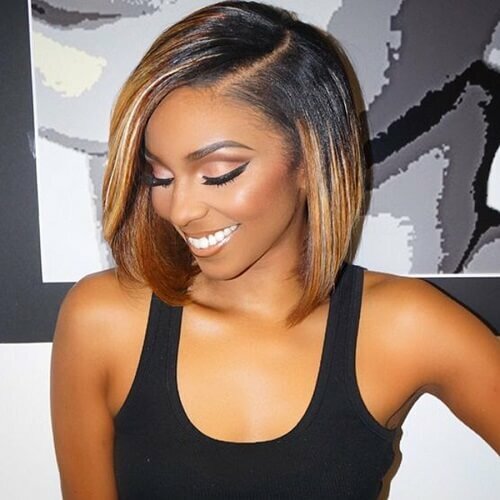 Singer Keri Hilson is also one of the top celebrities when it comes to inspiring us for black hairstyles. She shows us plenty of ways to sport medium-length hair, like these loose curls with side bangs. In a nutshell, Ghana braids look like Dutch braids but are weaved in a feed-in manner. 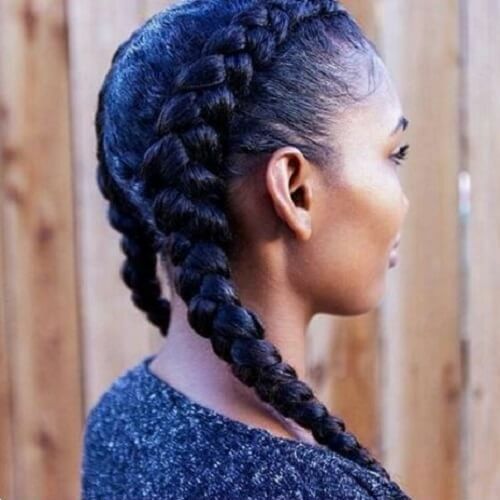 You can try this black hairstyle if you’re not into French braided pigtails or you want more volume all around. 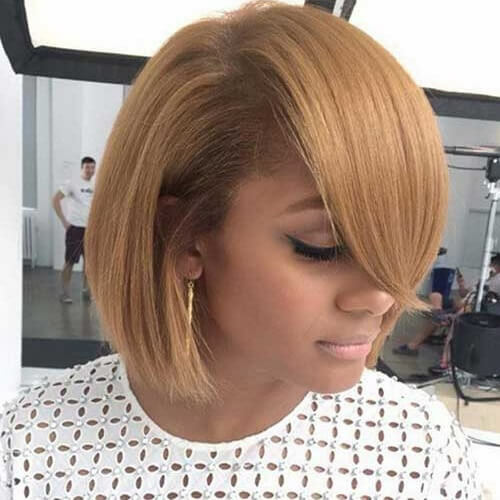 Bangs are what make this chic, layered, inverted bob complete. You can either get bangs to the side or directly down your forehead, whichever you find most flattering for your face shape. You can create the illusion of a mohawk if you have a pixie haircut with long bangs. Simply sleek down the sides and emphasize your curls on top and in the front. 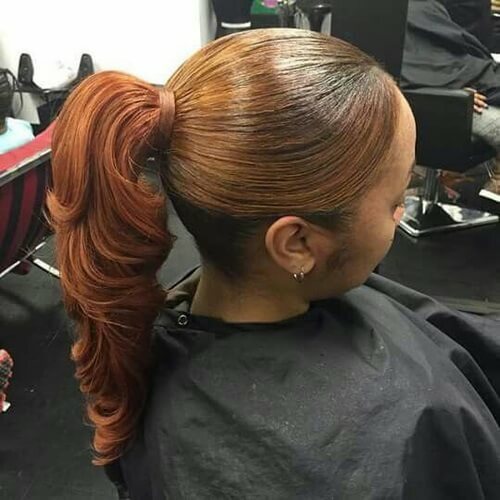 Ponytails always look fab, no matter if they’re braided or with silky extensions. In this case, you can opt for a lighter hair color and a sleek, long ponytail. 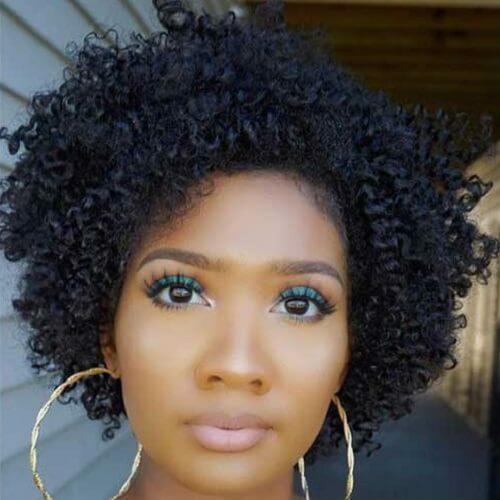 This is an excellent natural hairstyle that won’t require hours of braiding to get it. All you have to do is sweep your natural hair up and create a traditional braid. After that, wrap it around to form a large, beautiful bun. It’s almost impossible to talk about superb black hairstyles without bringing up Beyoncé. Queen Bey has rocked tens of styles throughout the years, but this one shows how long layered hair and straight bangs look. If you want to accentuate the difference between two colors, go for ombre hair. We recommend leaving the roots your natural hair color and applying your favorite secondary color to the rest. You can also prevent your countless curls from getting into your face while still enhancing them. A big, puffy ponytail will do the trick. 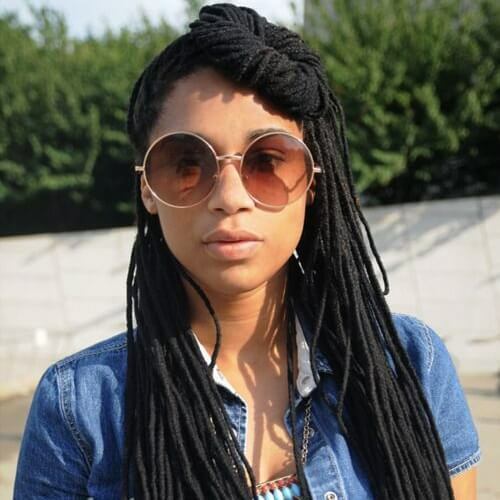 Women who do want dreadlocks don’t have to get them in a single color. For example, you can combine black and blonde for a playful approach to this hairstyle that has been around for ages. 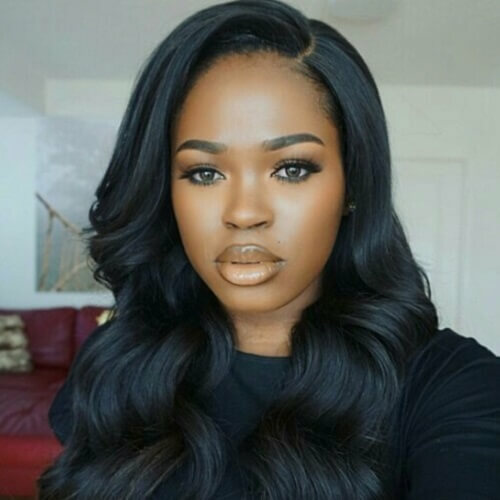 Channel your inner retro diva with this fabulous black hairstyle. It’s the perfect idea for a classy lady that wants to show off her refined tastes through her hairdo. 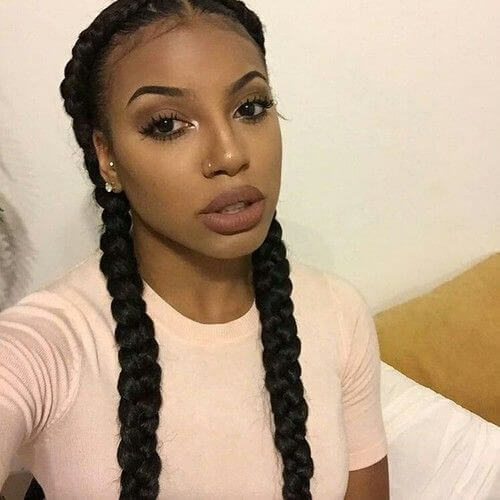 Even though we’re used to seeing bobs with straight, wavy or curly hair, they also look amazing with braids. 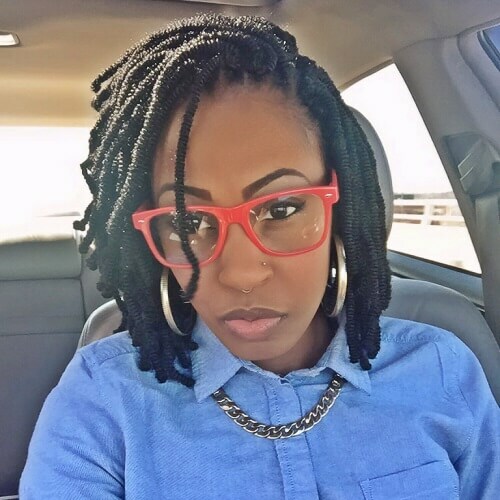 In this photo, you can see how a long, inverted bob looks like with gorgeous goddess braids. 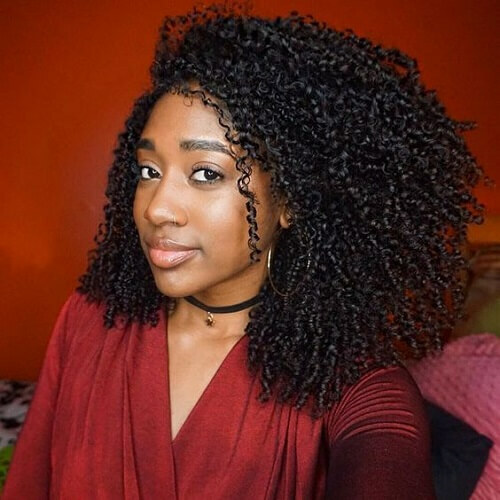 Flat twist out curls are absolutely beautiful in all lengths. This bouncy bob is practical, chic and suitable for any situation you could think off (and not to mention super cute!). In the end, black hairstyles should be a depiction of the wonderful women wearing them. As a result, you should take some time to analyze all the hairstyles that would suit your personality. Don’t rush and search for one that will bring out the best in you. Top it all off with a brilliant smile and you’re good to go!